Franklin County is rich with beautiful cycling routes. Whether you’re looking for challenging climbs into the surrounding hills or a leisurely ramble through river valley farm fields and meadows, the region offers options to fill a day, a long weekend or a week-long visit. We’ve asked local bike tour company, River’s Edge Cycling to share with us some of their favorite rides in the region. Most of them integrate elements of the amazing Franklin County Bikeway system. These mapped and signed routes total approximately 240 miles in length and covers the entire county, with connections to bordering counties and states. Much of the bikeway network consists of on-road or shared roadway sections that make use of predominantly low-traffic roads. There are several off-road bike paths as well that provide connections suitable for all riders. 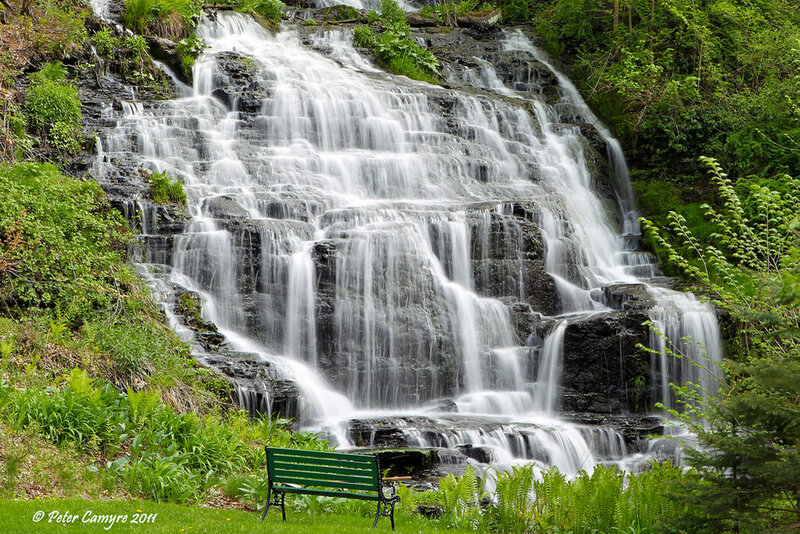 The Brooks, Books and Waterfalls Route rolls along the quiet back roads and pathways in Sunderland and Montague. The 23-mile route offers lovely views of a working canal and the Connecticut and Sawmill Rivers and features three impressive waterfalls. And, with only 650 feet of climbing, this route is one that many cyclists can enjoy. See the Brooks, Books and Waterfalls Route. Because it’s an “out and back” ride, the Brooks, Books and Waterfalls Route presents opportunities to begin at either end or even somewhere in the middle. We recommend beginning near the bike path entrance on First St. in Turners Falls. Park in the lot across from Unity Park. The Town of Montague’s Unity Park offers restrooms, a wonderful playground for kids and a shady spot for a picnic before or after the ride. Mile 1 - 2: Turners Falls Power Canal; The surging water on your right is not the Connecticut River, its the canal created in the late 1800s to channel the river’s energy to power the many mills that drove the Turners Falls economy. Today, that hydro power generates over 62 megawatts of electricity as it flows through turbines at two stations along the canal. You’ll be returning along this canal toward the end of you ride. Mile 5.1: Bicycle and pedestrian overpass; This bicycle and pedestrian bridge over the railroad was just completed in 2017. You may be lucky enough to see a train passing beneath you as it heads to the busy Deerfield Yard across the River. Mile 6.8: The Montague Book Mill, shops and waterfall; The Montague Book Mill has the curious tag line “Books You Don’t Need In A Place You Can’t Find”. 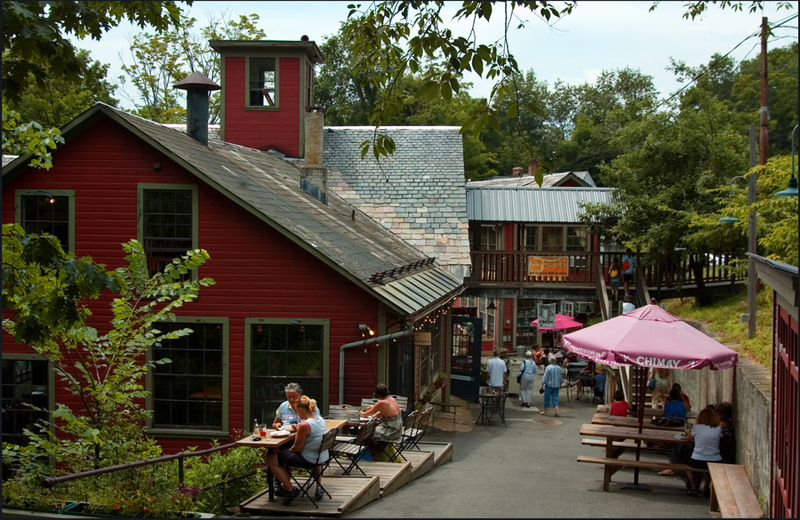 The used book store and accompanying shops and restaurants are a popular destination for cyclists due to the charming, historic structure and the soothing sound of the Sawmill River waterfall cascading over the rocks behind the building. Plan to linger. Mile 8 - 10: The soils deposited by the Connecticut River over the centuries have created some of the richest agricultural soils in the world. You’ll see extensive agricultural fields producing a wide array of crops and produce over the next few miles. Mile 10.4: Slatestone Brook Falls; The tumbling falls here powered two mills in the mid 1800’s. You can still spot the sluiceway and the stone foundations for the structures. Behind you is the Connecticut River. A ferry used to carry wagons and other traffic across the river here from Deerfield. Mile 11: Chard Pond and historic site. This falling water from this pond provided power to Munsell’s mill in 1830 and later generated power for the Sunderland Electric Light and Power Company in the early 1900’s. Mile 11.8: The large colonial house on the west side of the road was the birthplace of Monroe Smith, the founder of youth hosteling in the US. It became a hostel in 1937 and continued to serve cycling visitors until 1978. Turn around here to return. Mile 17.8: Notice the ornate house on the left after the pedestrian bridge. Can you spot Rapunzel’s golden braids tumbling down from the turret? Mile 22.5: Great Falls Discovery Center: Turn up the driveway from the Canal to check out the Great Falls Discovery Center. The museum offers educational displays showing the varying ecological landscapes found along the 410-mile length of the Connecticut River from the Canadian border to Long Island Sound. Mile 22.5: The Great Falls. Across from the pathway entrance to the Discovery Center, you’ll see a bridge over the canal to an island between the canal and the Connecticut River. From there, you can see the large dam (and depending on the season) waterfall as the river continues its journey south. Mile 22.6: Anadromous Fish Ladder; Just under the bridge you’ll see the entrance to the fish viewing station. Only open during the spring anadromous fish migration, you may be able to witness Shad, Salmon and other fish heading up stream to spawn. Be sure to visit some of the wonderful shops and restaurants in Turners Falls while you’re in town. There’s a fun collection of antique shops such as Loot on Avenue A and places to grab an ice cream, lunch or other refreshments after your ride.